North Brisbane Trees has all the equipment necessary to tackle the largest of tree removals through to full scale land clearing. Expert service requires only the best equipment and we have the right gear for the job. Our newest member to the truck fleet is our Isuzu 1000 with a 20m3 capacity chip bin. This truck has a hydraulically operated chip bin roof which allows us to load our A Grade Forest Mulch. Our 300HP Iveco Truck is equipped with 4WD allowing us to go where our competitors can’t. We also have a 22 metre truck mounted crane which will lift 440 Kg at full extension and a whopping 10 tonne at 1m. It’s in constant use hoisting tree limbs up and over obstacles and down to safety, including massive 2 tonne tree stumps, directly into one of our tip trucks. We have two chippers consisting of a Bandit 1590XP Chipper and a Bandit 1990XP. These 140HP and 250HP machines will take in 17 inch/24 inch diameter tree material with ease turning it into a useful mulch product that we recycle and sell to the public. The larger 1990XP Chipper is a 6.7 tonne / 250 horse power machine, that is one of the largest chippers in Australia and will take a 24 inch diameter hardwood log. When using our 2 tonne loader feeding the machine, we’re able to fill our 20m3 truck in an incredible 45 minutes! For hardwood tree material over 24 inch, we use our Superaxe Hydraulic Log Splitter to turn into firewood which we sell to the public. Our very useful and much loved piece of equipment is our German designed and manufactured Schaffer articulating Loader. With it’s wide turf friendly tyres and the fact that it articulates to turn, means that your lawn is completely unaffected! With attachments such as a rotating log grapple, 4 in 1 multi-purpose bucket and large light materials bucket, North Brisbane Trees can assist you with any landscaping requirements you may have and also earthmoving! 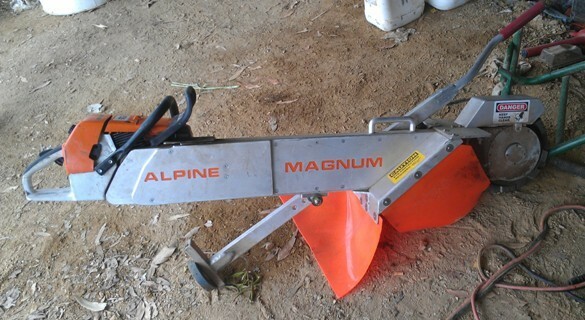 “The Alpine Magnum is a 10 horsepower machine designed for hard to access to stumps that larger machines are unable to get to. Weighing in at only 40 kgs means that this machine can be picked up and carried by only one person to the stump for quick stump removal. 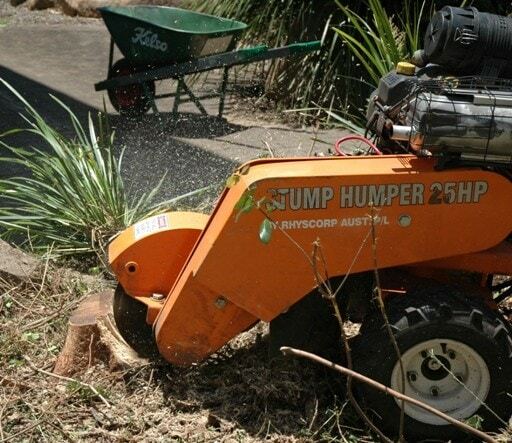 “The Stump Humper is an Australian made, 27 horsepower machine. This machine has hydraulically driven drive wheels and weighs in at 220 kgs. At only 29 inches wide, this machine will fit through even the narrowest gate. This stump grinder will tackle medium to large tree and palm tree stumps with ease. Palm tree removal is a breeze with this machine! “The Bandit 2900T is one of Australia’s largest stump grinders. This state of the art remote controlled, 2.7 tonne, 114 horse power, tracked machine will grind even the largest of stumps in a matter of minutes. The turf friendly rubber tracks will retract down to only 35 inches wide, allowing the machine to fit through a standard size garden gate. 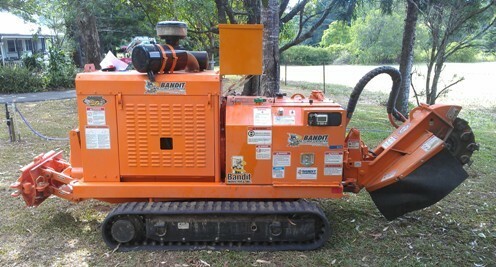 This machine is designed for large tree and palm stump grinding and light land clearing operations. We have a huge range of market leader Stihl chainsaws, from their smallest climbing chainsaws to their largest 55 inch Magnum 880 chainsaws. We are also equipped with all necessary climbing equipment to allow access to trees of any height and lowering devices to safely lower the heaviest of branches. This makes our tree removal and tree pruning services even more efficient. So what does all this mean for you, the client? It means that we have the correct equipment to get your job done quicker and more efficiently than our competitors, meaning WE CHARGE YOU LESS! 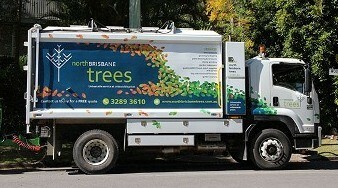 Compare North Brisbane Trees with other providers and see why we are the only choice for any Brisbane tree service you need.